Riley and I have been super busy with creating cute treats for her friends at daycare. After seeing a ton of rainbow treats on pinterest I decided to make lucky charm rainbow cupcakes. The cupcakes are frosted with buttercream frosting and topped with lucky charms. Oh so cute! Love all of it 🙂 I'm attempting to make cupcakes for my moms work party tomorrow. I have an idea in my head but NO idea if it will work. Great job on the rainbow cupcakes. I probably wouldn't be that successful, haha! Hello- So super Stinking CUTE! I love those treat bags- and Oh my- those Cupcakes! To die for! Love the colors!! Too much fun! Yum, those look amazing! I would love if you would link up to the Lovely Things Thursday Linky Party! i wish i could grab that cupcake through the computer screen and EAT IT NOW!! looks soo yummy! Those cupcakes are SO adorable!! Love the rainbow inside! Thanks for sharing at Shine on Fridays! So cute! I love all the st.Paddy's day ideas! Love the cupcakes- so cute!! Thanks for linking to Scout's Sweet Sunday!! How cute!! The cupcakes look wonderful and I love her gifts. Thank you for sharing at Sharing Saturday! I hope you are having a wonderful week! I simply want to say I’m all new to blogs and honestly liked this web blog. Very likely I’m going to bookmark your blog . You surely come with great articles and reviews. Regards for sharing with us your website. What a fun idea! Love how you made magic with each new color! Too sweet! This is so cute! 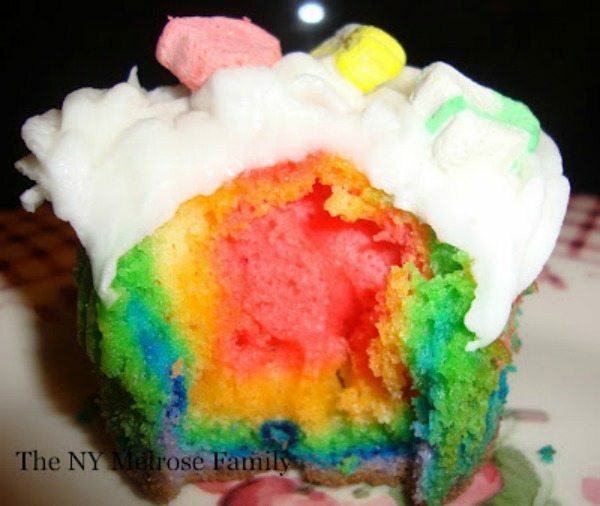 Love the cupcakes – how do you make the rainbow colors? So cute! I’m such a sucker for Lucky Charms too! Pinning! These are cute and really fun!